How confident are you at managing your own money? Moderately? Very? That’s good, you might think. But here’s the sting: overconfidence in one’s own judgement is the biggest cause of costly mistakes – and it’s all down to something called the Dunning-Kruger effect. Article by Nick Green. Remember how Baldrick would triumphantly announce, ‘I have a cunning plan!’? Edmund Blackadder’s clueless sidekick was the living, flea-ridden embodiment of the Dunning-Kruger effect. This behavioural concept (the discovery of which won the Ig Nobel Prize in 2000) describes the tendency of people who know very little to believe they know a lot. Yes, we all know that person… and probably one of our friends thinks it’s us. The truth is, most of us do this. But why? It comes down to the difficulty of knowing how much you don’t know. Singing, for instance, seems dead easy until you pick up a microphone – and even then you’ll sound ten times better to yourself than you will to your neighbours. By contrast (and this is even more interesting) a professional singer is likely to be highly self-critical and aware of their tiniest mistakes. Their ability is far higher, but their confidence may actually be lower. What is the Dunning-Kruger effect? As their knowledge level rises, they start to become aware of the extent of their ignorance, so their confidence takes a nosedive. 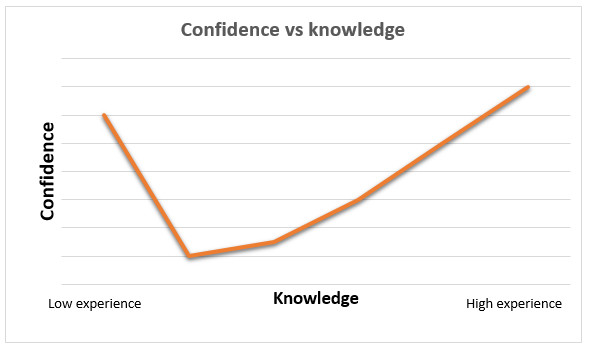 The subsequent growth in confidence is much more gradual as knowledge increases, and only when the individual is an expert does confidence pass its former high point. Other commentators have jokingly referred to this starting position as the ‘peak of Mount Stupid’, and to the subsequent revelation as the ‘Valley of Despair’. But those in the valley really shouldn’t despair – because they are on the way to understanding. The Value of Advice report by Unbiased revealed the most common reason why people chose not to take financial advice. It wasn’t the perceived cost (as one might expect) but confidence – 40 per cent of those who didn’t seek advice were confident they could make the best decisions for themselves. In light of the graphs above, that’s worrying. The FCA’s director of policy risk and research, Chris Woolard, seems well aware of the dangers. He warned the Work and Pensions Select Committee of the surge in pension-related fraud attempts since pension freedom was introduced. When asked who was most vulnerable, his response would have surprised some people (but not Dunning and Kruger). He said, ‘The person who is most vulnerable is often the most confident person.’ In addition, Woolard pointed out that the main targets of scams would be people with a lot of savings – and that these people would probably have the highest levels of confidence as a result. But having a lot of money doesn’t necessarily mean having the best knowledge of how to invest it. Confidence is the main culprit in what’s known as ‘confirmation bias’ – where you start out with a belief (e.g. that a particular investment is right for you) and then tend to favour only evidence that supports this premise. This may be one of the reasons why various studies have suggested women make better investors than men, despite often citing lower confidence in their financial knowledge. Now we see that it’s precisely this lower confidence that may give women their edge – it makes them less prone to confirmation bias, more likely to check their facts and less inclined to take silly risks. Just as you should be wary of overconfidence yourself, watch out for it in so-called ‘experts’ too. Learn to tell the difference between a genuine adviser and a salesperson. A regulated, independent financial adviser won’t ever deal in certainties, just in probabilities. The good IFA knows that many factors beyond their control can affect everything from mortgages to investments to pensions, and will build a prudent plan for you accordingly – they won’t ever suggest you sink everything into one ‘unbeatable’ investment. If anyone ever does offer you such a thing, take a look at the graph again and be suspicious. We think of confidence as a good thing, and generally it is. But true confidence is about knowing when to ask directions, instead of just driving on through the fog. Being generally comfortable talking about financial matters still isn’t the same thing as maintaining an in-depth knowledge of financial products, allowances, regulations and “what if?” scenarios. A non-specialist just can’t do that in the way a professional financial adviser does every working day. The FCA has warned about over-confidence increasing vulnerability to fraud, but the issue is much broader than that. Finance in general is a complex and ever-changing area, in which only the professional can be justifiably confident. So if you want to make it to the far side of that graph, the quickest route is to call up someone who really does have a good idea what they’re doing.